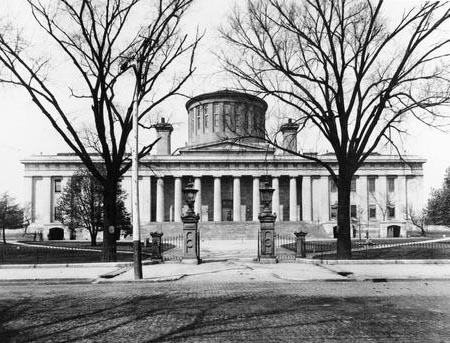 Reproduction of a photograph of the east side of the Ohio Statehouse facing Third Street in Columbus, Ohio, ca. 1900. The General Assembly is the legislative branch of Ohio's government. This body consists of the Ohio House and the Ohio Senate. Ohio's original constitution created the General Assembly in 1803. Originally, senators served unlimited two-year terms, while representatives served unlimited one-year terms. The legislature held the most power in state government, with the governor not having the power to appoint state officials or to veto legislation. Ohio's first General Assembly convened on March 1, 1803, with thirty members of the House and fourteen members of the Senate. Each county received a certain number of legislators based upon the county's population. Forty-nine General Assemblies met under the Constitution of 1803. In 1851, a new Ohio constitution, the Constitution of 1851, went into effect. This new constitution weakened the General Assembly, but Ohio's legislative branch remained the most powerful branch of the state government. Members of both houses now served two-year terms, but Ohio voters now elected judges and many state officeholders. The number of representatives and senators fluctuated with each session, as counties were no longer guaranteed a representative unless they had sufficient population. The General Assembly's power weakened further in 1903, when Ohio voters approved the veto power for Ohio's governor. In the same year, each Ohio county was guaranteed to have its own House member, while all other members of the House were to be at large positions. In 1966, by order of the federal government, this apportionment procedure ended. Under the new system, Ohio has ninety-nine representatives and thirty-three senators from various districts based on population. Under the old system, most legislators came from rural areas, but in recent years urban areas have been better represented. In 1956, Ohio voters agreed to extend senators' terms from two years to four years. In 1992, a state constitutional amendment limited legislators to eight years in each house of the General Assembly, meaning that a person could serve two terms in the Senate and four terms in the House. For the first several decades of Ohio's existence, the Democratic-Republican Party dominated the General Assembly. With the advent of the Whig Party in the 1830s and then the Republican Party in the 1850s, these two organizations battled the Democratic Party for control of the legislative branch. Throughout the late 1800s and most of the 1900s, the Democratic Party and the Republican Party commonly alternated control in the General Assembly. For example, between 1872 and 1904, control of the General Assembly's two houses changed a total of eighteen times. The Twentieth Century saw similar changes in leadership between the two major parties.